I’ve been poring over some of the new products I saw last month at the Consumer Electronics Show in Las Vegas. Here’s a selection among those that stand out and add to the use of your cellphone. Antenna79: I’ve been trying out a new phone case from Antenna79 for the iPhone 6 that’s designed to improve cellular performance. The case has a built-in antenna that works with the one in the phone to improve signal strength and transmission speeds. The intent is to reduce dropped calls and improve data speeds. The case in the antenna works passively, meaning there is no electrical connection with the phone. The case works with the iPhone 6 version for AT&T, Verizon and T-Mobile, but not Sprint. 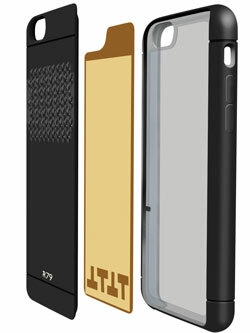 The case is a matte black, hard-plastic shell that snaps onto the phone. It adds little bulk to the phone and is similar in size to most standard cases. The gold-colored antenna element is sandwiched in the back of the case with a portion of it visible through a decorative grill on the back. The name of the company, Antenna79, refers to the number for gold in the periodic table. The company, originally called Pong, was founded in San Diego and makes cases designed to reduce radiation from the phone. Catterton, a private consumer-focused equity group from Greenwich, Conn., is the company’s major investor. The case is designed to work best when the phone is held in your hand or against your head. CEO David Vigil, a 20-year veteran of Qualcomm, says it works best in areas of marginal signal strength. I tried it using an iPhone 6 with Verizon service in about a half-dozen locations around San Diego. I used the free Ookla app (www.ookla.com) to test download and upload speeds with the case on and off, and with the phone up to my ear and in my hand, positioned to view the screen. I was unable to draw any conclusive conclusions from this test. That’s likely because there are many other variables, including tower congestion, Internet traffic, environmental conditions and lack of repeatability. In fact, when I measured speeds several times in a row, first with the case on and then with the case off, I’d get differences in upload and download speeds that were often larger than the differences with the case on and off. Anytime you tamper with the radiation patterns of a phone, it’s important that you don’t create new problems. The company has conducted extensive tests and says the phone meets all of the standards of the iPhone alone for the important measurement of SAR, the Specific Absorption Rate of RF energy in the body. In fact, they say it’s likely one of the most tested cases ever. The company plans to offer optimized models tailored to particular carriers as well as models for other phones and other colors. The product costs $60 for the iPhone 6 and $70 for the iPhone 6 Plus. Although my tests were inconclusive, this does not necessarily mean that the case does not work as designed. If you experience frequent dropped calls and slow Internet connections, it’s certainly worth a try to see if this helps. Other cases and mounts: Over the past few months I’ve received a wide variety of sample cases, for the new iPhone 6 and 6 Plus. Among them all, I prefer those with a front cover that protects the display, especially from scratches and damage to the coatings. Displays have coatings designed to reduce glare and smudges. • The Tech21 Classic Shell with Cover case for iPhone 6 offers a combination of protection, lightness and minimal bulk. Cases from this British company use a patented material as a liner to absorb impact to the phone when dropped. This new case is much like the hugely popular Frame case that’s been one of the Apple Stores’ best sellers. The difference is that it adds a thin hinged cover to protect the display, adding minimal bulk; calls can be made with the cover closed. $35 for the iPhone 6 and $45 for the iPhone 6 Plus. (www.tech21.com). • Another great case is the BookBook for iPhone 6 and 6 Plus. It looks like a vintage leather book that can also be used as a stand. The phone snaps into a plastic case within the book and can be removed and used separately. $60, www.twelvesouth.com. • When I’ve tried using my phone as a GPS, I’ve had trouble finding a way to mount it to the car, particularly when traveling and driving a rental car. I didn’t like the designs with a long arms and suction cup that sticks on the window: They’re too large to carry and not legal unless they’re attached to the corner of the windshield. The best solution I’ve found is the Airframe, a small U-shaped device that’s tiny enough to fit in your pocket. It pushes onto an air-conditioner vent with a rubber nub that works with varying thickness vents oriented both vertically and horizontally. The frame expands to fit all brands of phones with displays of up to 6-inches (including the iPhone 6 Plus). Some phones even fit while in their case. $25, www.kenu.com and at Apple Stores. • For a small, discreet mount that’s more permanent, Nite-Ize introduced at CES a mounting system called Steelie. It consists of a small steel ball that mounts to your dashboard using non-marring adhesive. A small magnetic disc sticks onto the back of your phone or case. The two connect with a firm click and allow a wide range of movement of the phone to position it just right. The disc is thin enough so as not to add much bulk to your phone. There are several elements that can be added, such as a stand for your desk, a ball mount for your vent and a case with the magnetic disk built in. About $30 from www.niteize.com. Are you torn between your old Blackberry and an iPhone? Typo offers a solution, the Typo keyboard and case. The keyboard looks much like a Blackberry thumb keyboard. (The original version looked so much like one that it was sued and had to recall their product). Typo adds ¾ inch to length and provides a very satisfactory type experience, almost as good as a Blackberry, although it doesn’t have all of the special Blackberry function keys and shortcuts, and the balance in the hand is not quite as good. The Typo is backlit, runs off of a rechargeable battery, and connects to the phone using Bluetooth. It replaces the home button with a substitute key, but it frees up a lot more of the display. To get around the patent, the company modified the shape of their keys. $99 at typokeyboards.com.